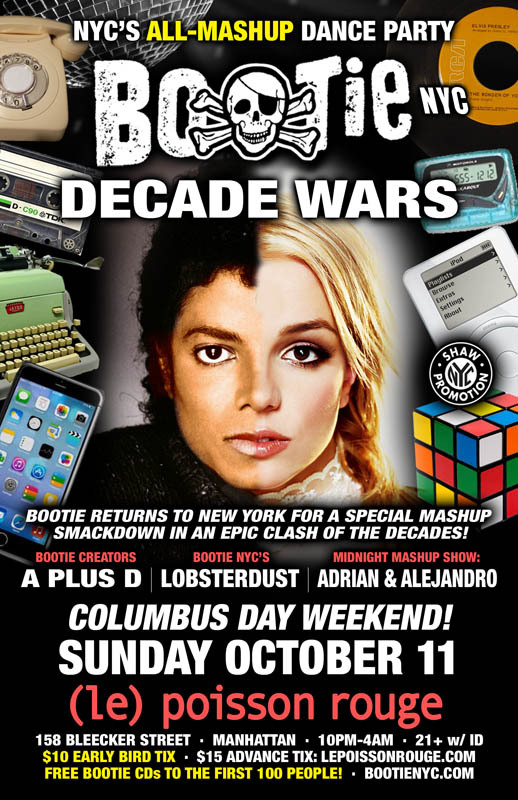 New York City Bootie NYC: Decade Wars! All genres and eras mixed and mashed into new song creations, pitting decade against decade, to keep you dancing all night! There is nothing Bootie loves more than the musical culture-clash that mashups make possible. And nowhere is that more evident than in mashups that use artists from different decades in order to create brand-new songs that you’ve almost, but not quite, heard before! Direct from San Francisco will be Bootie creators and DJs A Plus D, joined by Bootie NYC’s own Lobsterdust, as they mix and mash music from the ’50s, ’60s, ’70s, ’80s, ’90s, ’00s, and NOW — paying homage to the originals while keeping the music fresh in an epic multi-decade mashup smackdown! Plus, Adrian and Alejandro take the stage for the Midnight Mashup Show! All this, plus FREE Bootie mashup CDs to the first 100 people through the door!